iLibs allows to manage multiple iTunes libraries. You can create a Jazz library and a Rock library & synchronize your iPod with one of them according to your mood of the day. If there are several iPods but only one computer in the household, iLibs lets you manage each person's libraries without messing up the ones of the others. iLibs features multiple users, multiple libraries and multiple iPods with a dummy-proof interface. iTunes 8 ready! ...... After a couple of unwanted synchronizations of your iPod songs with the ones from other people's libraries, you probably ended up creating several Windows user accounts to keep your music and the one of your friends or family separated, which is long, complicated, unsafe and inconvenient. 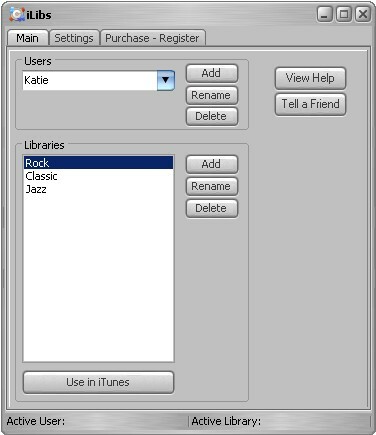 With iLibs, you easily create and control more than one iTunes library, while logged in the same Windows account, on the same computer. Create different users and new libraries for each of them, either from scratch or from your existing libraries or the ones of another user. iLibs is totally flexible while still absolutely safe! Qweas is providing links to iLibs 2.25 as a courtesy, and makes no representations regarding iLibs or any other applications or any information related thereto. Any questions, complaints or claims regarding this application iLibs 2.25 must be directed to the appropriate software vendor. You may click the publisher link of iLibs on the top of this page to get more details about the vendor.